If you have spent anytime in an elementary school cafeteria you see hundreds of snack and drink pouches thrown away in a garbage. Did you know that you can help your school turn this trash into cash? During the next few months, schools can emphasize eco-friendly habits to the next generation. 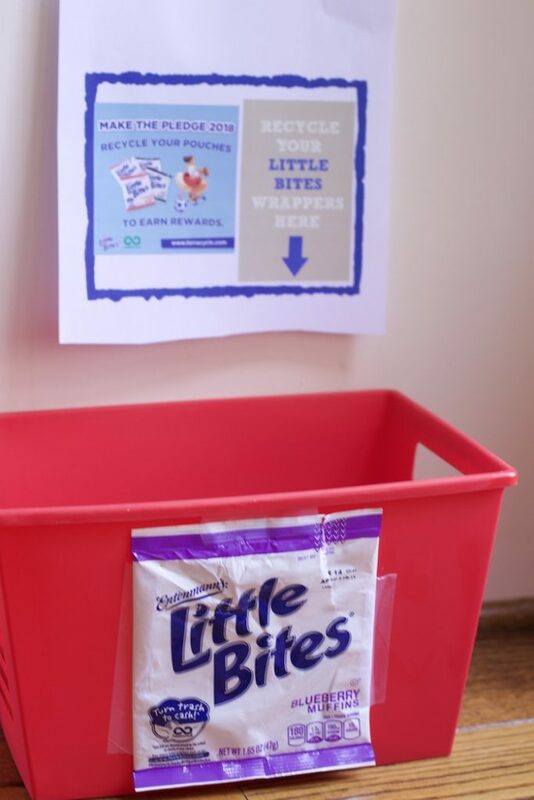 Instead of just talking about Earth Month, get the kids to recycle consistently during the months of February, March, and April. 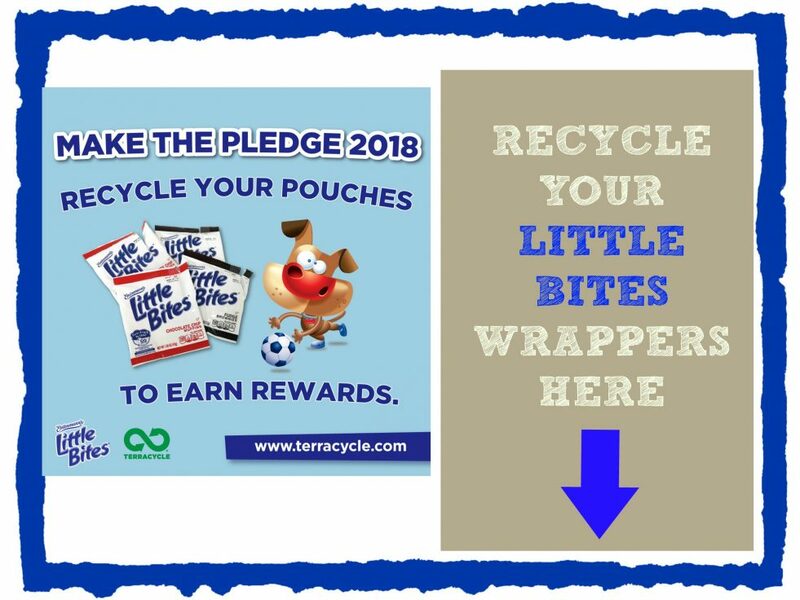 Plus, if you collect Entenmann’s Little Bites® pouches on behalf of a K-12 school, you could be placed in the running to win a Classroom Party. 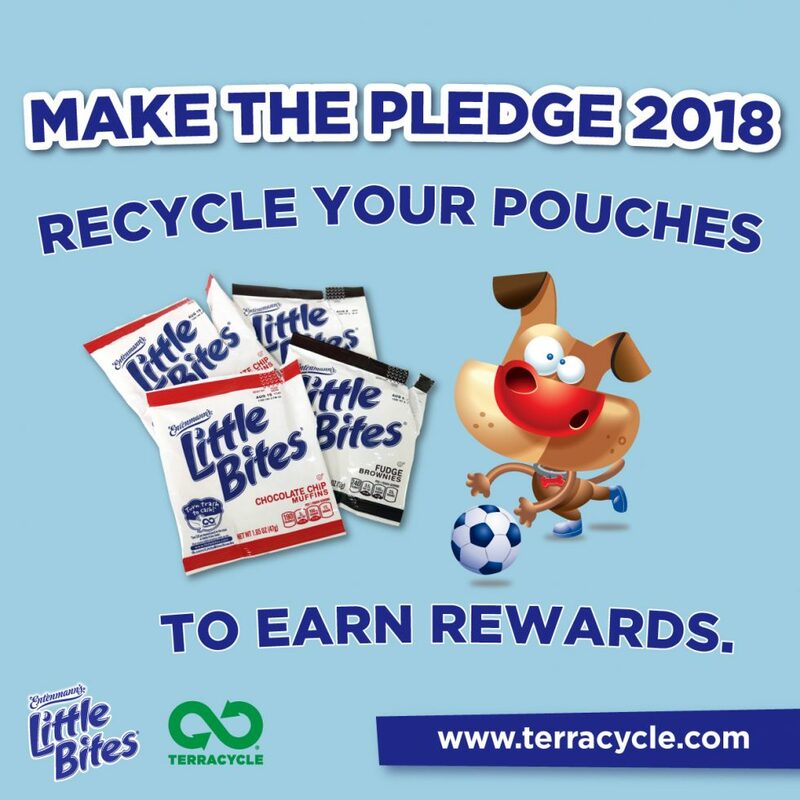 It’s easy to participate: make the pledge, send in the waste, and earn more rewards. Be sure to enter the GIVEAWAY at the end of the post for our READERS too. Be sure to print out this free Sign to encourage classmates to take part in this trash for cash Easy school fundraiser. 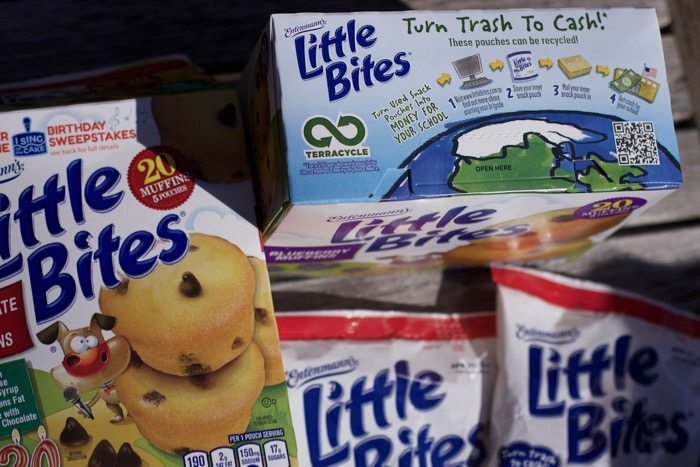 So many varieties to choose from: Chocolate Chip,Blueberry Muffin to seasonal varieties, Little Bites® are baked soft and moist, made with real ingredients, and never contain any high fructose corn syrup. I would want to try the basil. The Blueberry Mini Muffins are our favorite! I would love to try the Chopped Basil. My favorite Little Bites flavor is the chocolate chip muffins. I would try the crushed ginger from Dorot first. I can crush garlic and chop cilantro relatively easy, crushed ginger is much more difficult. I would try the crushed garlic first. I LOVE Cilantro, so I would choose that tray to cook soup with. I love the Brownie Little BItes, and so does my nephew. My favorite Little Bites flavor is the Party Cake and my daughter loves the chocolate chip! We are seriously addicted to Little Bites! I love the blueberry, my son loves the party cake. I’m going to try the banana bites next. Ɗɑddy ԝіns!? The twins declared. I love the Brownie Bites ones! I like blueberry little bites! Oh we love garlic in our family…cook with it so often. I would love to try the Crushed Garlic Tray first! Our favorite Little Bites flavor is the Chocolate chip! Our little ones favorite! I would love to try the crushed garlic tray because I love garlic! The chocolate chip bites are my kids favorites! I would like to try the Dorot Chopped Parsley Tray first. My favorite little bites flavor is banana! I would use the Crushed Garlic Tray first. Blueberry flavor is my favorite! I like the Chocolate Chip Muffins!!! I’d try Crunchy Topped Cheese Hash Browns. Blueberry bites are my favorite. I would try the Sautéed Glazed Onions first. I would use the Crushed Garlic Tray. I would like to try the preportioned herbs. I would try the Crushed Garlic Tray first. I like Little Bites blueberry muffins. I like the banana flavor. I love the blueberry flavor. Fudge brownies is my favorite. I haven’t tried them, but I think my favorite would be strawberry. Fudge Brownies is a great flavor. My favorite is the Little Bites snickerdoodle muffins! Unfortunately I can’t eat them anymore because I was diagnosed with Celiac Disease, but my husband loves to eat the blueberry ones! I like the fudge brownie bites flavor. I have not had any flavor of Little Bites yet. I like the Blueberry Flavor little bites. My favorite flavor is any of the birthday cake flavored ones. My favorite are Little Bites Strawberry Yogurt Muffins. I love the party cake and crumb cake Little Bites!